From a 2011 edition of Elderberries, the Horowhenua District Council's free two-monthly magazine for residents aged 50 and over. Thompson House, or the Thompson Memorial Cultural Centre, promotes the cultural, visual and other arts for the Horowhenua. This gracious old home, built in the 1920's, is popular with commuity organisations, artists, craftspeople, clubs and individuals for meetings, workshops and exhibitions. Thompson House was named aftger Dr SJ Thompson in recognition of his extensive contribution to the life and growth of at least 24 organisations within the District. The house still exhibits the warmth and style of his wife, who was known for her hospitality and her enjoyment and encouragement of the arts. 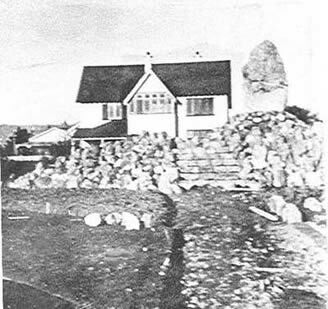 Dr SJ Thompson came to Levin in 1924 and brought the property in 1926. It was a working household, with the surgery and waiting rooms on the east side and a home-built swimming pool to the west. The three sons were sternly told to keep quiet during surgery hours. The oldest, Alan later helped transform the home into a community centre, and Graeme is currently chairman of the house committee. Bay with a carload of first aid supplies, donated by Levin's chemists. He chaired the first local Aero Club which flew out of a Tararua Road paddock and became known as the Tararua air strip by 1929. Visiting famed pilots included Francis Chichester. A keen horseman, Dr Thompson became president of the Manawatu Hunt and a Captain in the Manawatu Mounted Rifles; and was involved in racing, tennis, the RSA and Levin Club. Mrs Thompson was more focused on the arts, including music, painting and the theatre and encouraged her husband to become a founding member of the Levin Operatic and Dramatic Society. A regular film-goer at the old Regent Theatre, "the doctor always had a seat reserved at the end of a row, in case of interruptions, and he seldom saw a show to the end. The sight of his lean form flitting out often heralded the arrival of a new citizen." (Levin:The Making of a Town by Anthony Dreaver 2006). When the RNZAF training wing at Weraroa was established at the outset of World War Two, Dr Thompson served as station medical officer throughout the war as squadron leader, as well as advising the home guard and maintaining an overloaded medical practice. The home became an entertainment centre for many airmen and later for officers of the great 2nd US Marine Division at McKay's Crossing. The reputation for hospitality at Thompson House grew over the following years. The first Soldiers' Memorial was erected in the Bath Street Public Gardens near Thompson House, in 1922. The war memorial was made of a large natural stone from the Arapaepae hills and was set on a mound of other stones with steps leading to it and was modified and developed only last year by another voluntary committee, 'Adopt An Anzac'. In 1973, the property was purchased by the then Levin Borough Council for use by the community. The Horwhenua District Council remains responsible for the external maintenance and the surrounding grounds, now part of the Levin Remembrance Gardens. 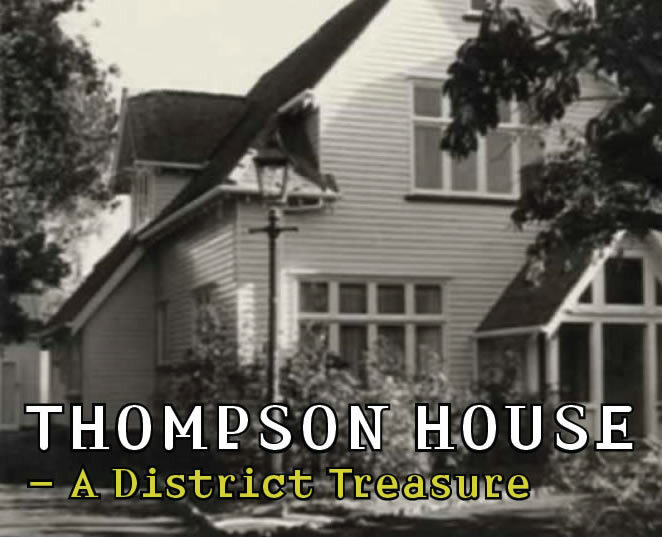 An autonomous voluntary committee, elected annually, manages the operations and finance of Thompson House. Day-to-day running costs are generally funded by over 30 organisations and many occasional users including staging art and other exhibitions. The aim is to maintain this fine old homestead to a high standard while fully serving the community. The Horowhenua District Council maintains a register of Notable Buildings which includes Thompson House. Thomspon House with the War Memorial under construction in the foreground (1922). It is also registered with the New Zealand Historic Places Trust as a building which merits preservation because of its historical significance and architectural quality (Class C). Exhibitions and workshops held at Thompson House have included: arts, crafts, antiques, works in glass, silver and bronze, prints and photography. Also poetry readings, book launches, literary workshops and market days. These have all been well supported by the community. Four rooms which can accommodate 12 - 60, people are available for hire at a modest cost, as is the larger upstairs Gallery. Phone 06 368 5023 to make a booking.